We left Luke Cage submerged in acid and near-death, but the Power Man is not about to quit. Claire Temple and Dr Burstein found a way to work together to remove the remains of Diamondback's Judas. 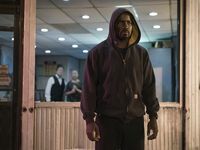 While they succeed, Cage tries to put an end to any of chance of Dr Burstein continuing the work that led to Carl Lucas' initial transformation into the Power Man. His example of pure strength shows he has returned to his best, and he takes the drive to ensure the man we met at Seagate can not return to that work, but Cage may not have caught everything. With Dr Bernstein out of the picture, Cage and Temple refocus their energy on tracking down Diamondback. More importantly, it's about learning more about both Lucas' and Willis Stryker's joint past. 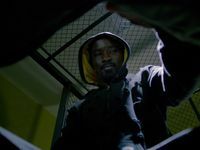 Flashbacks dripped throughout the episode, in particular Misty Knight's investigation, reveal more about the history, and it gives Cage and Temple exactly what they need to continue their mission. Meanwhile the police focus on investigating Cage, who is framed for further attacks on the New York Police Department. 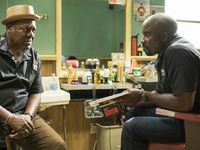 An overzealous investigator takes out his frustrations on an innocent student, and that gives Alfre Woodard's Mariah Dillard another opportunity to gain political points. 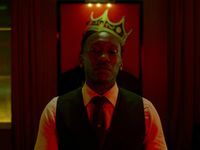 She makes a public stand against Cage and the police at Cornell Stokes' club, and again, Woodard reaffirms her place as one of the series' best performers. It also presents one of the best set pieces of the series so far, as Misty Knight, Cage and Temple converge on Diamondback's position atop the club. As good as the action and camerawork is as Cage rescues a wounded Knight from the top floor amidst a hail of automatic gunfire, it is also a credit to the writers to ensure they have spaced out the shootouts. There is only so many scenes in which Cage can simply turn his back and play human shield, but they're used sparingly enough to ensure it doesn't go stale.